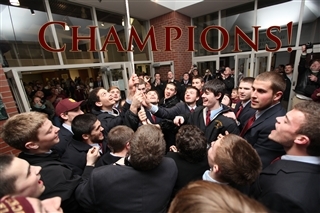 The Thornton Academy boys hockey team closed out their season with a dominating win 5-1 against St. Dominic high school to capture their second state title in just two years.The Golden Trojans played St. Dominic twice during the regular season and each time TA won convincingly. The third meeting between the two teams ended the same way.C.J. Maksut, one of 14 seniors on the team and Thornton’s all-time leading scorer, netted three goals during the game. Andrew Carignan and Greg Lodge supplied the other two goals for TA. Thornton had a strong team all year long and ended their season with a 20-1-1 record. With the win, either Biddeford or Thornton has won the class A state championship in five of the last six years. That’s quite an accomplishment for a team from York County.